Recently our team put together notes from the field into a new whitepaper: The 5G Revolution. In it, we discuss the fact that 5G demands software capabilities and methodologies that are new to CSPs and telecom software solution providers. Read this post to learn the top four critical database components required from the new 5G database. In the coming months, Communication Services Providers (CSPs) across the globe will be busy rolling out the 5G network. 5G is fundamentally different from 4G, LTE, or any other network the telecommunications (telecom) industry has ever seen before. It promises data rates 100x of 4G, network latency of under 1 millisecond, supports 1 million devices/sq. km., and 99.999% availability of the network. 5G will generate data at an unprecedented velocity and immense volume. This “fast data” will fuel a wide range of data-driven services and digital business models. However, to capitalize on this opportunity, your organization needs to operationalize fast data and make informed business decisions in-event and in real-time. 5G ITU IMT-2020 specifications demands speeds up to 20 gig per second and a target latency of 1 ms. This unprecedented combination of high speed and low latency will open the flood gates on data streaming. Legacy databases & disparate NoSQL data stores are just not capable of performing complex transactions and analysis on this high throughput data (millions of tps) at low latency (in ms). As discussed earlier, 5G networks will generate vast multitudes of streaming data from not only 5G enabled apps, but also from the network, subscribers, enterprise users, network operators and call processing. 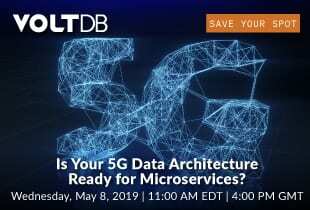 It would be essential for the 5G database to scale linearly at a moments notice while maintaining the high performance and low latency requirements all along. The database powering the apps and microservices is expected to have High Availability (HA) especially across multiple geographies (XDCR), and Disaster Recovery (DR) built-in. Additionally, 5G’s latency requirements are causing CSPs to move to active-active XDCR, as the speed of light makes a single large data center too slow for end users. The 5G database needs to seamlessly work in the cloud, and also be orchestrated in a containerized environment. With the emergence of 5G the need for real-time actionable decisioning is greater than ever before. The perfect solution for a 5G powered world; is a fast and scalable in-memory operational database that can ingest millions of transactions per second, either in the cloud or on-premises. With a real-time database powering next-generation apps & microservices; developers can monetize their fast data to create a competitive advantage. Transforming their infrastructure from post-event to in-event and actionable. Download the full paper to understand the parameters required of a 5G database and test drive VoltDB free for 30 days.